Step 4.1: Right-click on the OneDrive icon in the notification area on the right of the taskbar. If it is not there, click on the up arrow or caret (^) icon to bring up hidden icons, then you should see the OneDrive icon. 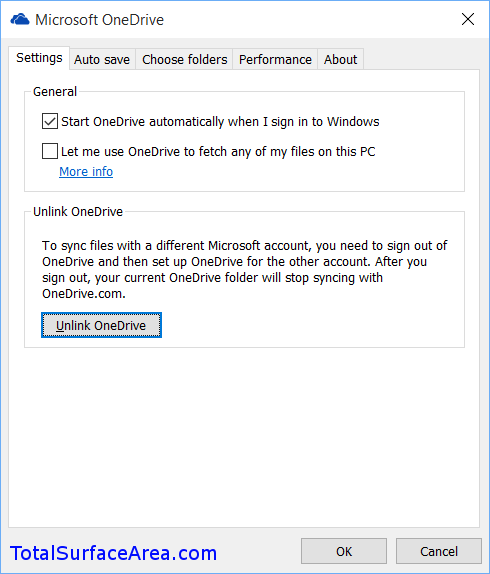 Step 4.2: In the Microsoft OneDrive window, click Unlink OneDrive. 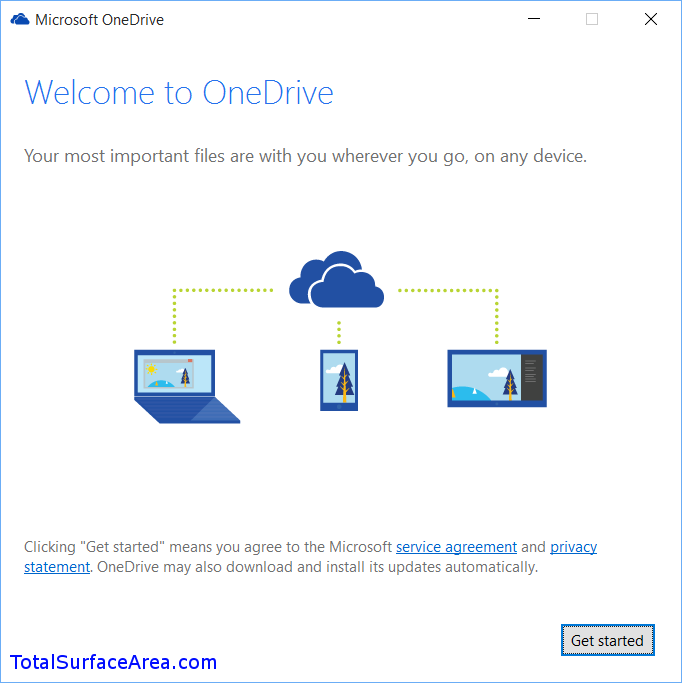 This will unlink your OneDrive account from your current local OneDrive location. Step 4.3: In a new Microsoft OneDrive window and welcome to OneDrive message, click Get started. Step 4.4: Next is the sign in message. 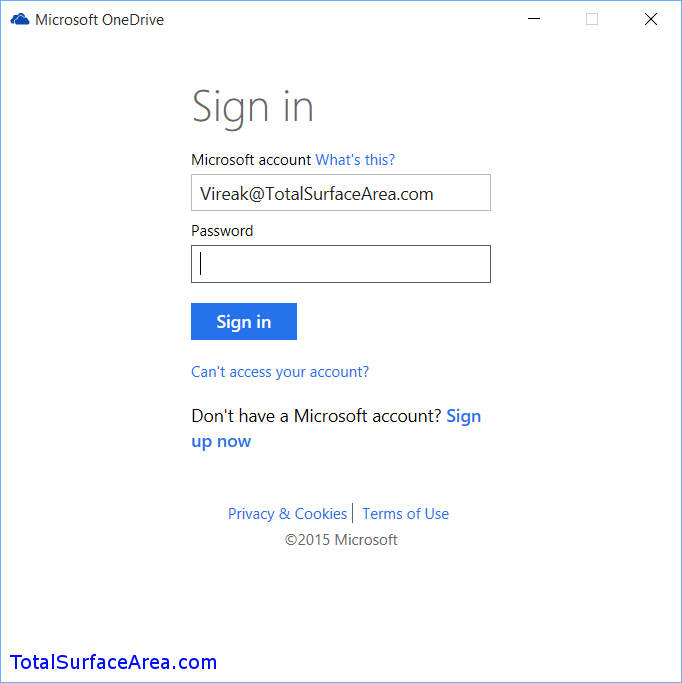 Sign into your Microsoft account by entering your credentials and click Sign in. If you have multi-factor authentication turned on, be prepared to verify with your cell phone, email, or other means. 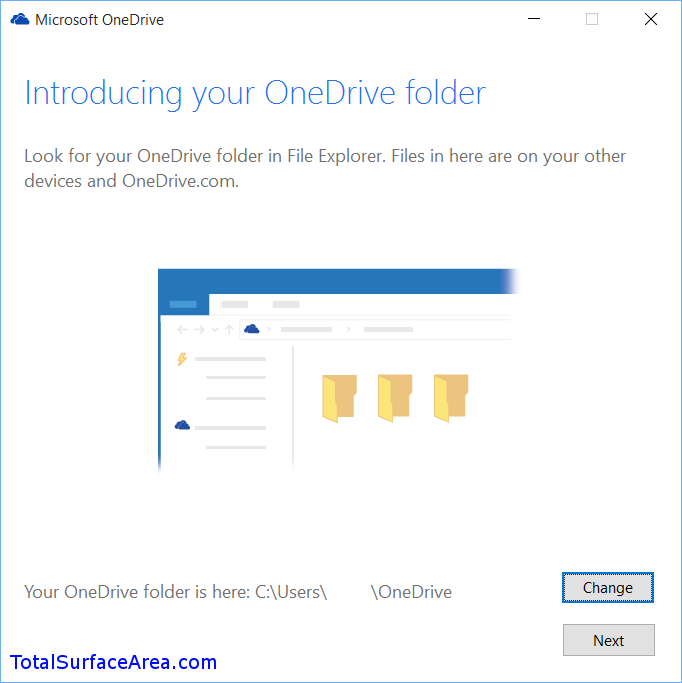 Step 4.5: Next is introducing your OneDrive folder. The default points to your User folder in your main system drive. We want it to point to your newly created virtual hard drive on the removable drive. Click Change. Step 4.6: In the Browse For Folder window, select “This PC” and select your virtual hard drive. 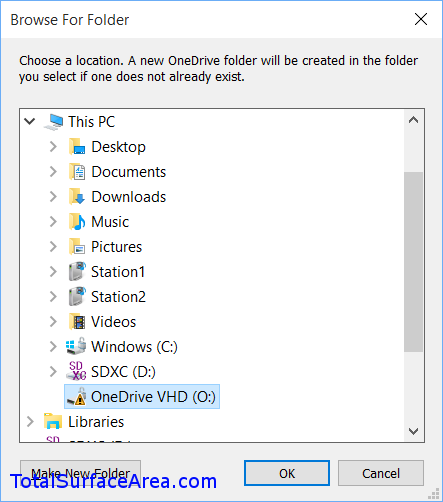 Mine shows “OneDrive VHD (O:)” as pictured. Click OK. Step 4.7: Back to introducing your OneDrive folder. It should now show your virtual hard drive. Mine shows O:\OneDrive. Click Next. Step 4.8: Next is the selection of files and folders you wish to sync between OneDrive and this PC. In the example below, I have over 118GB on OneDrive, so there is not enough space on my virtual hard drive (drive O:) by 1.5GB. 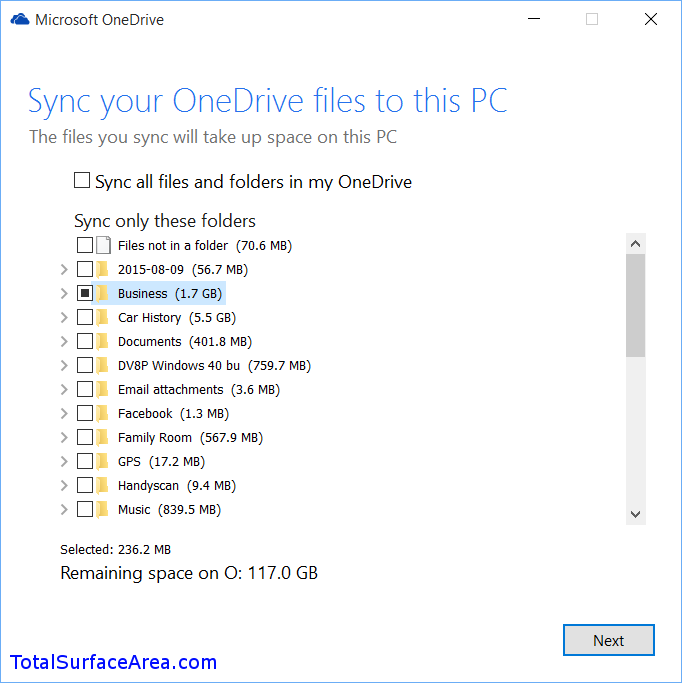 For my purposes, I do not need to sync my whole OneDrive contents to my Surface Pro 3. I selected a few folders here for this example (236MB) so it would not take too long. For yourself, select the folders and files you would like to sync and click Next. Do not worry too much about the selection if it is hard to decide. You can always change these folders later. 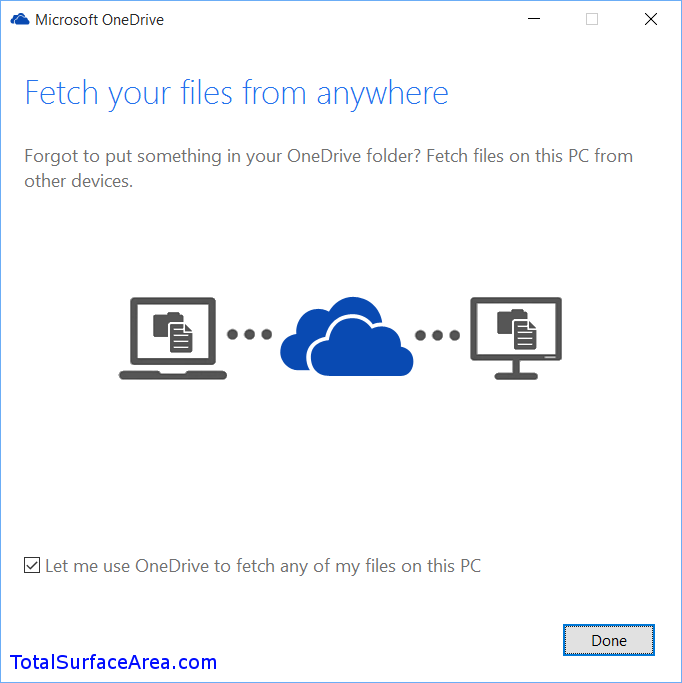 Step 4.9: Once you get to the “Fetch your files from anywhere” message, you are done setting OneDrive up to sync with your removable drive! Click Done. 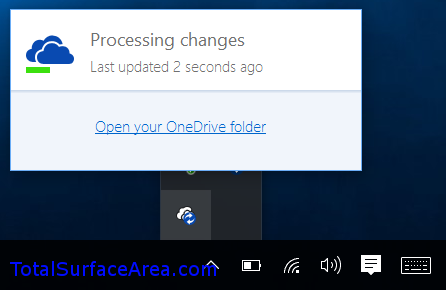 Step 4.10: To check OneDrive’s syncing progress, click on the OneDrive icon in the notification area on the right of the taskbar. If it is not there, click on the up arrow or caret (^) icon to bring up hidden icons, then you should see the OneDrive icon. It should show its progress. 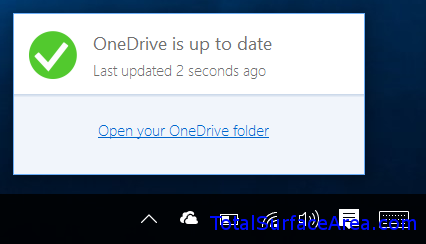 Once it is done syncing, you should get the wonderful “OneDrive is up to date” message when you click on the OneDrive icon. Now…you are done. Woo hoo! It should now work great with your removable drive, like a micro SD card or a USB flash drive. However, there are a few quirks you should be aware of. 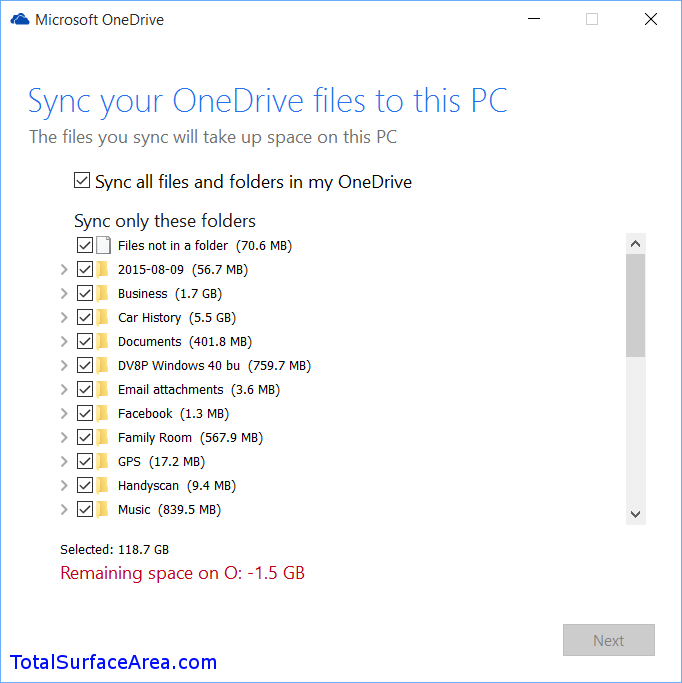 If you haven’t already, see the Removable OneDrive Quirks section of the Main Article on how to resolve these little quirks. 1) What happens if I remove the SD-card from the computer (Surface Pro 3 in my case) and put it into another device? It should be readable right? What about when I turn on the surface without the SD-card there. Will it have any trouble, other than not finding the One Drive files? 2) Your instructions seem to indicate that the entire SD-card becomes One Drive, dynamically re-sizing. Could I put something other than One Drive files on that card? My guess is that this is a bit more complicated, but do-able. Thank you so much for this, and for the clear instructions. I’m not actually using OneDrive but another cloud storage system that wouldn’t let me sync to a removable drive…does now though! This works great! Supper clear detailed instructions. I appreciate your work. Is there a way to rectify this and have it available, showing in explorer and available. Once this is formatted, I assume that along with One Drive, we can also add other files to that SD card? Thank you so much for the step-by-step instructions. This is perfect. Really well done! I appreciate the time and effort you took to make this set of instructions. Thank you for the step by step guide. My problem would be that I have documents on a different drive (in my case the local C drive) and my pictures on an external drive. Is there a workaround to point to an eternal drive for one specific folder? i did everything up to the point were you right click on the one drive icon, go to settings, and unlink it. i have no option to unlink it. Did i do something wrong? I am not a big fan of OneDrive but do use Carbonite as a backup service. Carbonite does not recognize my Micro SD card which I would like to use for file storage allowing more of the C: drive to be available for programs. Will this process resolve that issue? works great – thanx for all the work you put into this presentation. For unknown reason, I’m stuck at changing location of OneDrive as it says “unable to change to this location”. The sdcard is gpt & ntfs formated. Any idea whats wrong ? Worked great, thanks! FYI…it took a bit long to sign out when the OneDrive was unlinked, but eventually the new window OneDrive Welcome/setup window came up, be patient. BTW, this was done on a Surface Go with a microSDXC…thanks again!